Is your Thanksgiving menu set already? I've noticed that everyone's Pinterest boards are brimming over with yummy recipes lately, as we prepare gathering and having people in. We have made this stuffing recipe the past several years and it's hands-down our favorite thing on the plate (ok other than the mashed potatoes) so I wanted to share it with you, too! 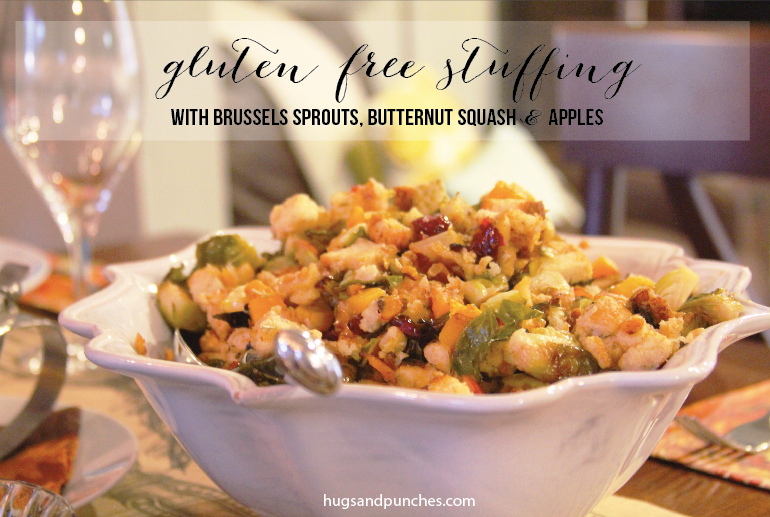 I mean, something with brussels sprouts, butternut squash, & apples, AND it's gluten free? Because yes...even the kids love it. Our family isn't 100% gluten free, by any means. But when I have the choice between one or the other, I often choose to go the GF route. So, when I found this amazing recipe with some of our favorite veggies, I had to try it! It's SO worth the extra time!! Toss the butternut squash (I bought it precut at Costco), brussels sprouts, apples, and shallots in 2 Tablespoons oil and season well with salt and pepper. Roast until vegetables are very tender (I like my brussels sprouts a bit singed & blackened along the edges). Remove from oven. Heat one Tablespoon of oil in a large pot. Sauté the onion and celery for 5-8 minutes, until translucent. Add the bread cubes with the veggies in the oil and allow them to get golden brown. Add a dash of salt and pepper. Add the roasted vegetables, vegetable broth, cranberries, pecans, and seasonings. Stir the mix till the broth has almost entirely absorbed in the toasted bread. Transfer to a baking sheet and bake at 350 for about 20 minutes. Enjoy! I for one, am never using Stove Top again! Do you have any favorite recipes for Thanksgiving?! I'd LOVE for you to share them in the comments! !